From Goodreads: Maisie Danger Brown just wanted to get away from home for a bit, see something new. She never intended to fall in love. And she never imagined stumbling into a frightening plot that kills her friends and just might kill her, too. A plot that is already changing life on Earth as we know it. There’s no going back. She is the only thing standing between danger and annihilation. From NY Times bestselling author Shannon Hale comes a novel that asks, How far would you go to save the ones you love? And how far would you go to save everyone else? This is a very fast read, but the plot itself moves much too quickly, in my opinion. 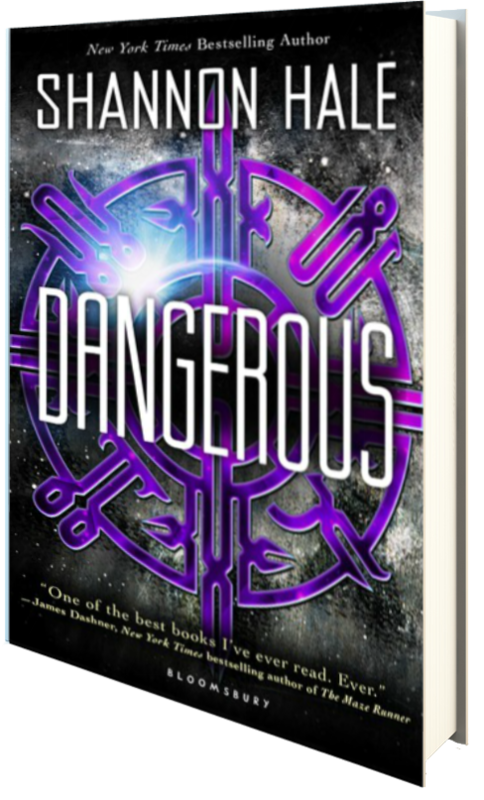 We meet the main character, Maisie, and almost immediately, she’s whisked off to astronaut camp, meets a boy, they make out, he dumps her, they get injected with alien DNA on “accident”… and on and on it goes, with little to no character or plot building to ease the reader through it all. And because of this, I personally found all five main characters to be bratty and stuck up; I didn’t care for any of them because I never had time to get to know them—the novel moved so quickly that we were off on the next adventure/mishap before I had time to wrap my head around the last. And since there was no real time to make any connections with the “fireteam,” as they so aptly name themselves, it was doubly hard for me to get into the novel. So while the premise was interesting enough, as were the effects the alien substances had on the five, it just moved too quickly to be enjoyable or hold my interest. Truthfully, I didn’t find much of the novel plausible, and with so much happening and the characters constantly speaking in a “scientific manner,” I had a hard time following some of their conversations–like those about the changes their bodies were going through, or how Maisie was able to take apart and rebuild things so easily. Now, the novel did get a little better as it unfolded, but even so, it was still choppy in its execution and just didn’t hold my interest due to its lack of plot development. Unfortunately, this novel just wasn’t for me. Two stars. Bloomsbury USA Children’s Books has been extremely gracious in allowing me to read an ARC of this novel, via Netgalley, prior to its release tomorrow, March 4, 2014, in exchange for an honest review.